1. It can charge 6V, 9V and 12V batteries. Batteries rated at other voltages can be charged by changing the values of zener diodes ZD1 and ZD2. 2. Constant current can be set as per the battery capacity by using a potmeter and multimeter in series with the battery. 3. Once the battery is fully charged, it will attain certain voltage level (e.g.13.5-14.2V in the case of a 12V battery), give indication and the charger will switch off automatically. You need not remove the battery from the circuit. 4. If the battery is discharged below a limit, it will give deep-discharge indication. 5. Quiescent current is less than 5 mA and mostly due to zeners. 6. DC source voltage (VCC) ranges from 9V to 24V. 7. The charger is short-circuit protected. D1 is a low-forward-drop schottky diode SB560 having peak reverse voltage (PRV) of 60V at 5A or a 1N5822 diode having 40V PRV at 3A. Normally, the minimum DC source voltage should be ‘D1 drop+Full charged battery voltage+VDSS+ R2 drop,’ which is approximately ‘Full charged battery voltage+5V.’ For example, if we take full-charge voltage as 14V for a 12V battery, the source voltage should be14+5=19V. R2 = 0.7/Safe fault current. R2 and T1 limit the charging current if something fails or battery terminals get short-circuited accidentally. To set a charging current, while a multimeter is connected in series with the battery and source supply is present, adjust potmeter VR1 slowly until the charging current reaches its required value. 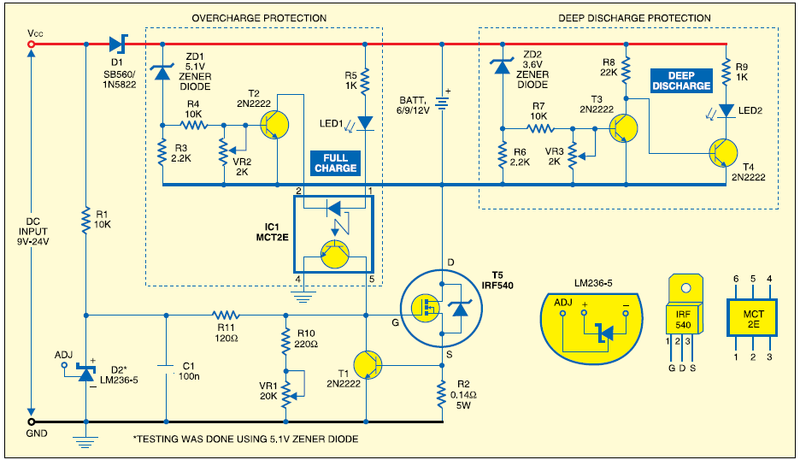 Overcharge and deep-discharge protection have been shown in dotted areas of the circuit diagram. All components in these areas are subjected to a maximum of the battery voltage and not the DC source voltage. This makes the circuit work under a wide range of source voltages and without any influence from the charging current value. Set overcharge and deep-discharge voltage of the battery using potmeters VR1 and VR2 before charging the battery. charging stops. Normally, zener diode ZD2 conducts to drive transistor T3 into conduction and thus make transistor T4 cut-off. If the battery terminal voltage drops to, say, 11V in case of a 12V battery, adjust potmeter VR3 such that transistor T3 is cut-off and T4 conducts. LED2 will glow to indicate that the battery voltage is low. Values of zener diodes ZD1 and ZD2 will be the same for 6V, 9V and 12V batteries. For other voltages, you need to suitably change the values of ZD1 and ZD2. Charging current provided by this circuit is 1 mA to 1 A, and no heat-sink is required for T5. If the maximum charging current required is 5A, put another LM236-5 in series with diode D2, change the value of R11 to 1 kilo-ohm, replace D1 with two SB560 devices in parallel and provide a good heat-sink for MOSFET T1. TO-220 package of IRF540 can handle up to 50W. Assemble the circuit on a general- purpose PCB and enclose in a box after setting the charging current, overcharge voltage and deep-discharge voltage. Mount potmeters VR1, VR2 and VR3 on the front panel of the box.